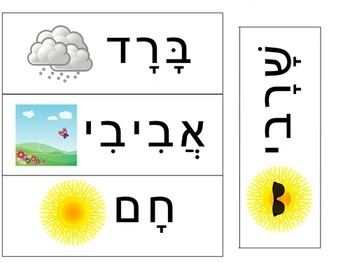 This is an interactive Hebrew wall calendar, perfect for classroom or homeschool. Suitable for all ages! 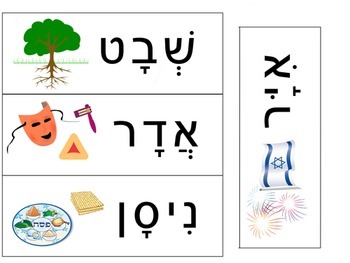 great for teaching Jewish holidays, calendar, days of the week, language. 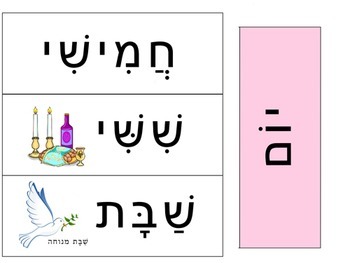 Days - title ("Yom") and hebrew days (Rishon till Shabbat) - Shishi (Friday) and Shabbat (Saturday) the only days with illustration - approx. 6.3"x2.5"
Date - title ("Taarich") and hebrew date (letters Alef to Lamed) - approx. 2.5"x2.5"
Month - title ("Chodesh Ivri") and hebrew calendar months with an illustration, mostly of holidays/occasions of the month - approx. 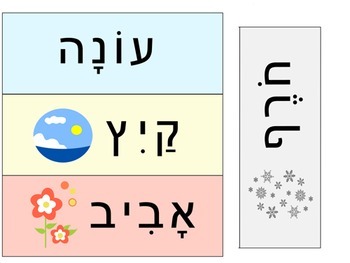 6.3"x2.5"
Season - title ("Ona") and 4 seasons (Kaitz (summer), Choref (winter), Aviv (spring), Stav (autumn) with a season illustration - approx. 6.3"x2.5"
Weather - title ("Mezeg Ha Avir") and 11 different weathers (Cham (hot), Gashum (rainy), etc..) with a weather illustration - approx. 6.3"x2.5"
I recommend printing on cardstock and laminating all parts.